I know it's almost spring, even though we have a winter storm warning here in Wisconsin, but I wanted to tell you guys about my favorite pom-pom hat I've been rocking all season. Winter here is always rough and this year is no different. 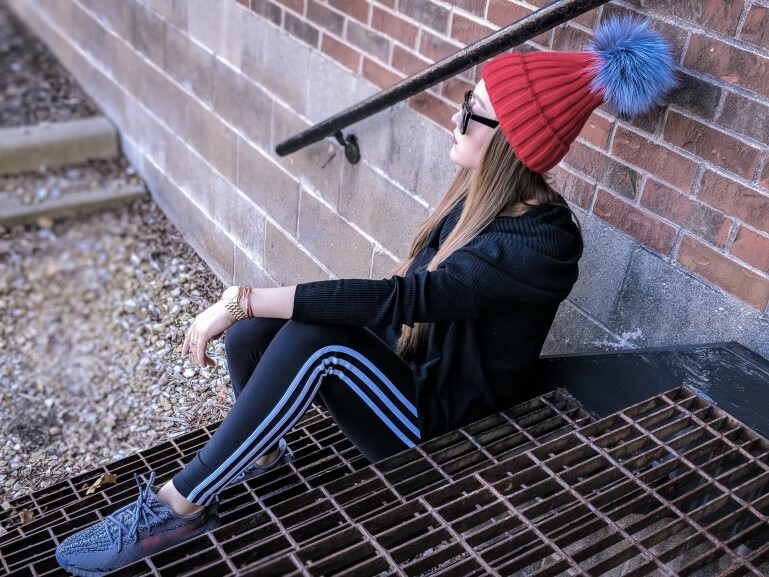 I've been adding a pom-pom hat to every outfit and have received a ton of questions and compliments. I originally purchased a gorgeous royal blue wool beanie with brown fur on our trip to Iceland, but I was specifically looking for a grey fur pom to wear with my favorite HiSo grey shearling coat. I ended up finding the perfect hat on Amazon of all places and for under $20! I ordered the red hat right away, and I was so impressed with the quality I ended up ordering a pink and black for myself, as well as matching hats for my girlfriends in white, grey and black. Several of my other friends fell in love and have purchased their own! The hat looks great on, completing any winter outfit. It's super warm and not itchy, which sometimes these hats can be. The fur ball is puffy, large and really stands out. The nice thing is that the puff is detachable, so you can easily wash the hat without ruining the fur. You can buy the hat here in several different colors! I know winter is hopefully almost over, but you won't regret this purchase. Such a stand out in it! Glad you love it!